Countries With National Health Insurance Hold Down Costs By Operating More Efficient Health Care Systems. The defenders of national health insurance often point to the low level of health care spending in other countries as "proof" of efficient management. Nothing could be further from the truth. By and large, countries that have slowed the growth of health care spending have done so by denying services, not by using resources efficiently. How much does it cost a hospital to perform an appendectomy? Outside the United States, it is doubtful that any public hospital knows. Nor do government-run hospitals typically keep records that would allow anyone else to find out. One reason why Margaret Thatcher called for systematic health care reform was that even Britain's best hospitals did not have computerized records, and it was not uncommon for the head of a hospital department to be unaware of how many people the department employed. In organizational skills and managerial efficiency, the public hospitals of other countries are far behind hospitals run by Hospital Corporation of America, Humana or American Medical International. More often than not, government-run hospitals in other countries are disastrously inefficient. It is not unusual to find a modern laboratory and an antiquated radiology department in the same hospital. Nor is it unusual to find one hospital with a nursing shortage near another with a nursing surplus. Where excellence exists, it usually is distributed randomly – often the result of the energy and enthusiasm of a few isolated individuals rather than decisions by hospital managements. 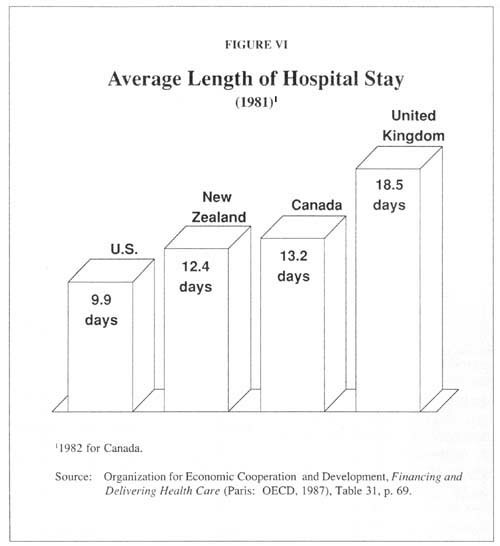 The average hospital stay is 39 percent longer in New Zealand, 42 percent longer in Canada and 61 percent longer in Britain. 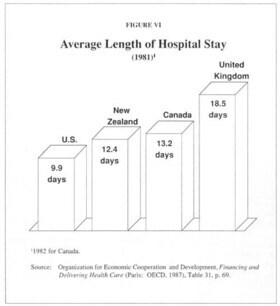 The average hospital stay among all OECD countries is 76 percent longer than in the United States. Almost all health care economists agree that widespread inefficiencies exist in the U.S. health care system. But we will not improve our efficiency by adopting the practices of other countries.